Selling at farmer's markets is the best and the worst part of our business. 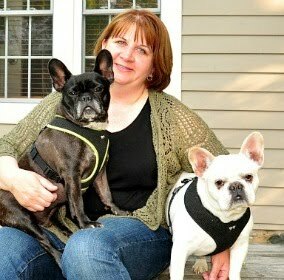 It's the best because we are interacting with others and talking to our customers. It's the worst because we are out in all of the elements. Snow? Yup. Rain? Most of the time (sometimes we cancel if we believe our products will be damaged). Heat and humidity? Indeed! Yes, you can absolutely put straight aloe gel or aloe liquid on the skin that is affected. 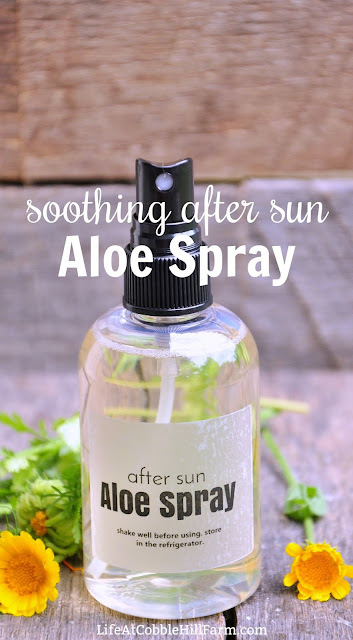 Or, you can make this cooling and soothing multi-purpose spray. This spray is also very good for wind burns in the winter. And another nice thing is it doubles as an anti-itch and healing spray for bug bites or other skin irritations. Keep it in your refrigerator to spray as needed (it's even more soothing when it's cool!). Homemade healing remedies, lotions, soap, home cleaners, etc. are some of the best natural products you can find. They are also often very economical. For these reasons I plan to share more of the recipes for products we use in our own household so that you can make them for yourself and your family too! 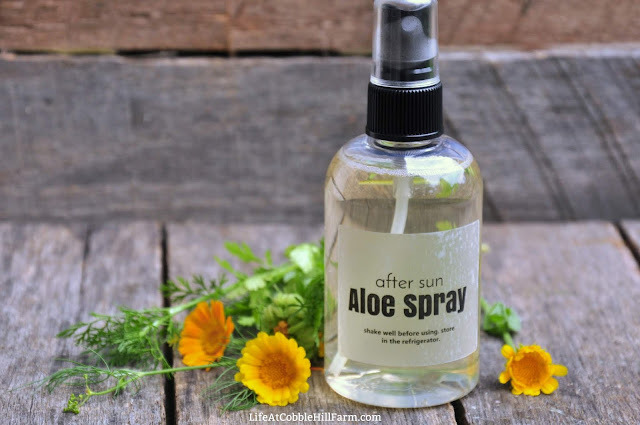 Aloe Vera Liquid - Make sure you purchase aloe vera liquid and not gel. It should look like water. It should also be clear and not artificially colored green. You can often find this in health food stores. 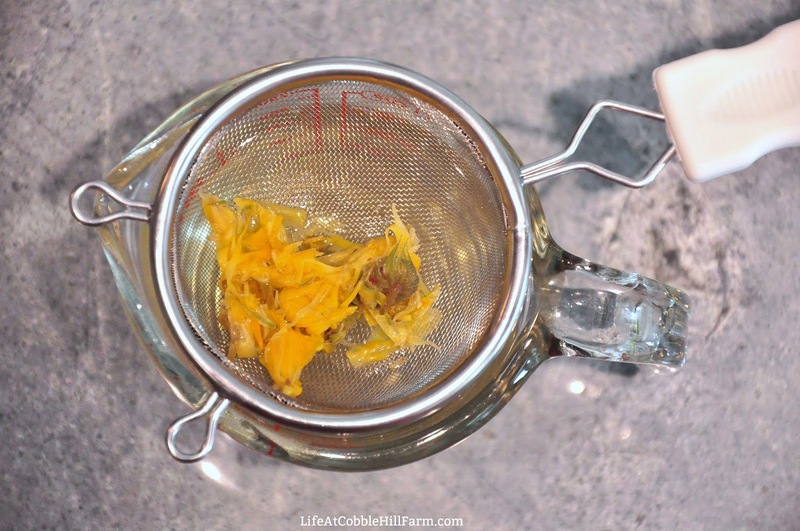 Calendula Infused Distilled Water - Calendula, known for it's soothing effects on the body, is a great anti-inflammatory herb to use for an infusion. You could substitute this with chamomile or violet if you would prefer, or just use distilled water if you would prefer no herbal infusion. Witch Hazel - is made from the bark of the witch hazel tree and is an astringent known for reducing inflammation and soothing skin. 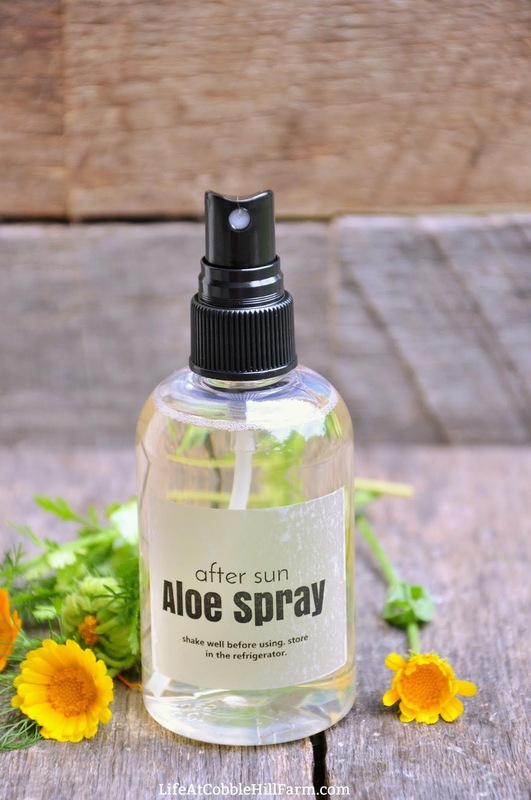 It also reduces itching, making this spray very useful for bug bites or skin irritation as well. Essential Oils - you can absolutely leave this unscented. If you would prefer not to use lavender or rosemary, you could also use chamomile or rose otto. If using just lavender (and not adding rosemary), use 20 drops of lavender. 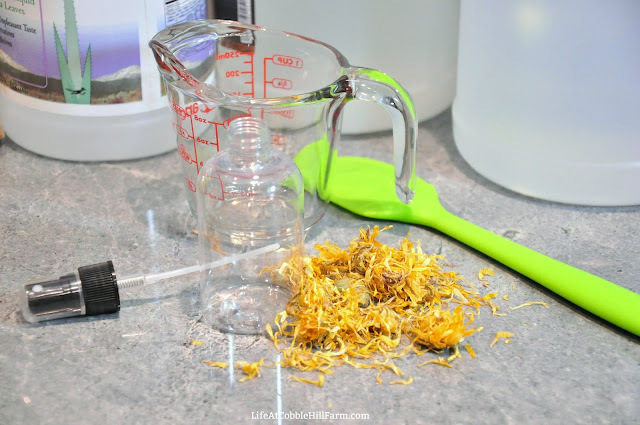 To make the calendula infused distilled water: Add 1/3 cup of distilled water to 1 Tablespoon dried calendula flowers in a small saucepan over medium-high heat on the stovetop. Bring to boil and then turn off the burner and remove pan from heat. Let sit 30 minutes to cool to room temperature as well as to infuse. 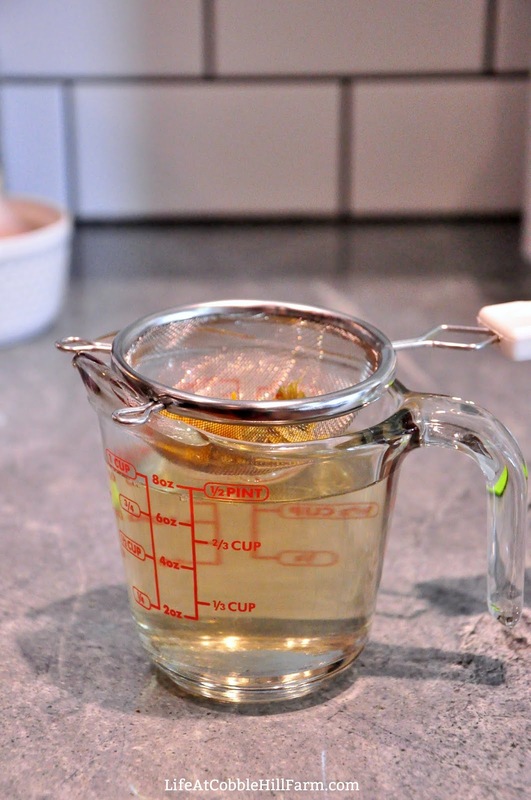 Strain and measure out 1/4 cup of strained calendula-water for the recipe. 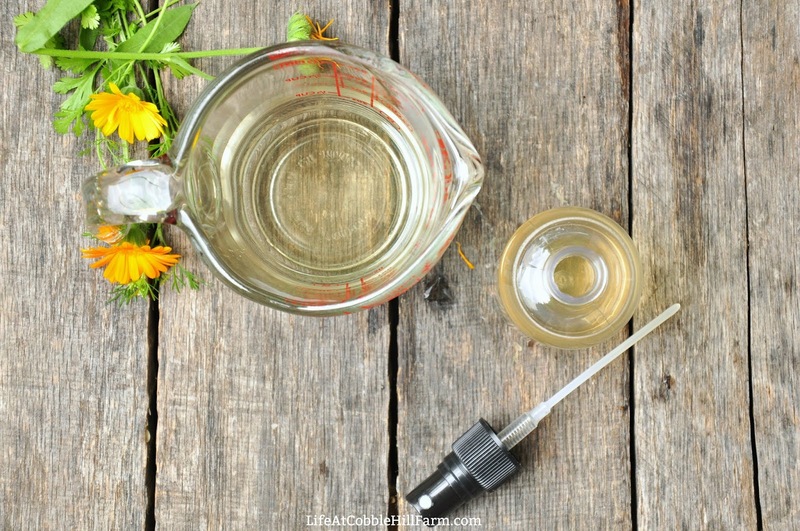 To make the aloe spray: In a measuring cup with pour spout, measure out aloe vera liquid, witch hazel, and calendula-infused distilled water. Add the vegetable glycerin and essential oils, if using. Stir well to combine. Pour into spray bottle(s) and store in the refrigerator 1-2 months. Shake well, to combine the ingredients, prior to using. Use as frequently as needed, allowing to air dry on the skin after spraying. I think I need to start growing calendula! This dermatitis gets so itchy, this would be a great thing to try.